EUR/USD fell back to the bottom of the range after it got carried down with stock markets. What's next? The path of least resistance is down. 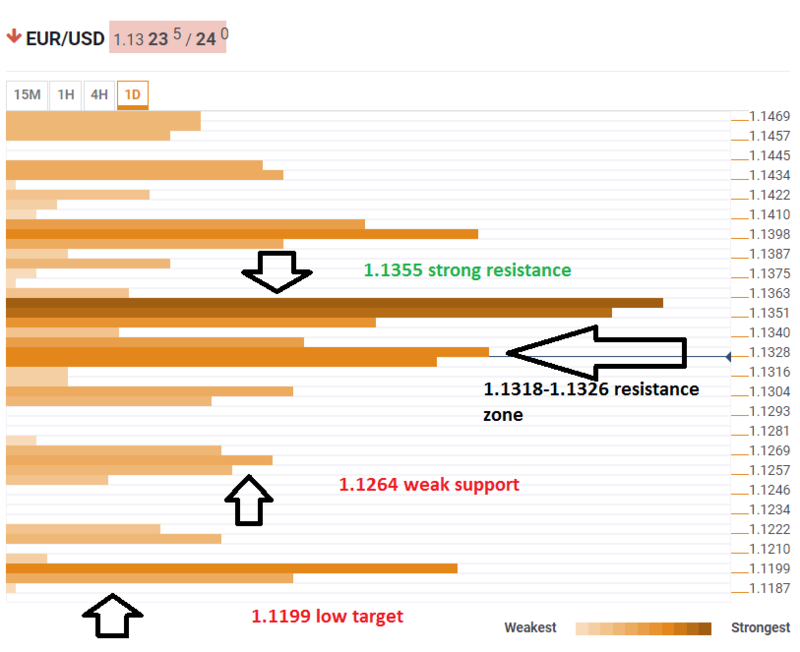 The Technical Confluences Indicator shows that the world's most popular currency pair is mired in the 1.1316-1.1328 region which is a dense cluster of levels including the Fibonacci 61.8% one-month, the Simple Moving Average 5-15m, the SMA 10-15m, the Fibonacci 38.2% one-week, and the Bollinger Band 15m-Lower. If the pair recovers from current levels, fierce resistance awaits at around 1.1355 which is the convergence of the SMA 5-4h, the Bollinger Band 4h-Middle, the Bollinger Band one-day Middle, the SMA 10-4h, the SMA 100-4h, the Fibonacci 38.2% one-day, the SMA 200-1h, and the Fibonacci 61.8% one-week. Looking down, we see weak support at around 1.1264 which includes the Pivot Point one-day Support 2, the PP one-month S1, last week's low, and the Bollinger Bands one-day Lower. Further down, 1.1199 is the confluence of the PP one-week S2, the PP one-week, S3, and the PP one-month S1. All in all, the downside is more appealing than the upside .